These Thorlos mountaineering socks are a great mixture of wool and THOR.LON which gives great cushioning as well as maximum warmth and durability to these socks. 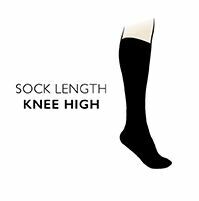 These socks feature thick cushioning in the ball and heel for reducing shock, impact, shear and blisters. As well as light cushioning at the instep and the in the arch for protection against lace pad pressure, these socks also contain spandex for better support and a better fit. They also feature a ventilation panel for extra comfort. 100% Wool toe for maximum warmth.